Translated by: T.Yamamoto, Japanese Grails Doc Translating Team. Special thanks to NTT Software. These will show you how to install Grails too, not just the JDK. A JDK is required in your Grails development environment. A JRE is not sufficient. if you're using bash or another variant of the Bourne Shell. Don't forget that in the interactive console, we have auto-completion on command names. So you can type "cre" and then press <tab> to get a list of all create-* commands. Type a few more letters of the command name and then <tab> again to finish. The above command will create a new controller in the grails-app/controllers/helloworld directory called HelloController.groovy. Why the extra helloworld directory? Because in Java land, it's strongly recommended that all classes are placed into packages, so Grails defaults to the application name if you don't provide one. The reference page for create-controller provides more detail on this. The action is simply a method. In this particular case, it calls a special method provided by Grails to render the page. This will start an embedded server on port 8080 that hosts your application. You should now be able to access your application at the URL http://localhost:8080/helloworld/ - try it! If you see the error "Server failed to start for port 8080: Address already in use", then it means another server is running on that port. You can easily work around this by running your server on a different port using -Dserver.port=9090 run-app. '9090' is just an example: you can pretty much choose anything within the range 1024 to 49151. This is the Grails intro page which is rendered by the grails-app/view/index.gsp file. It detects the presence of your controllers and provides links to them. You can click on the "HelloController" link to see our custom page containing the text "Hello World!". Voila! You have your first working Grails application. One final thing: a controller can contain many actions, each of which corresponds to a different page (ignoring AJAX at this point). Each page is accessible via a unique URL that is composed from the controller name and the action name: /<appname>/<controller>/<action>. This means you can access the Hello World page via /helloworld/hello/index, where 'hello' is the controller name (remove the 'Controller' suffix from the class name and lower-case the first letter) and 'index' is the action name. But you can also access the page via the same URL without the action name: this is because 'index' is the default action . See the end of the controllers and actions section of the user guide to find out more on default actions. For more information on the capabilities of interactive mode refer to the section on Interactive Mode in the user guide. IntelliJ IDEA and the JetGroovy plugin offer good support for Groovy and Grails developers. Refer to the section on Groovy and Grails support on the JetBrains website for a feature overview. IntelliJ IDEA comes in two flavours; the open source "Community Edition" and the commercial "Ultimate Edition". Both offers support for Groovy, but only Ultimate Edition offers Grails support. With Ultimate Edition, there is no need to use the grails integrate-with --intellij command, as Ultimate Edition understands Grails projects natively. Just open the project with File -> New Project -> Create project from existing sources. You can still use Community Edition for Grails development, but you will miss out on all the Grails specific features like automatic classpath management, GSP editor and quick access to Grails commands. We recommend that users of Eclipse looking to develop Grails application take a look at Groovy/Grails Tool Suite, which offers built in support for Grails including automatic classpath management, a GSP editor and quick access to Grails commands. See the STS Integration page for an overview. NetBeans provides a Groovy/Grails plugin that automatically recognizes Grails projects and provides the ability to run Grails applications in the IDE, code completion and integration with the Glassfish server. For an overview of features see the NetBeans Integration guide on the Grails website which was written by the NetBeans team. Since Grails' focus is on simplicity it is often possible to utilize more simple editors and TextMate on the Mac has an excellent Groovy/Grails bundle available from the TextMate bundles SVN. Grails uses "convention over configuration" to configure itself. This typically means that the name and location of files is used instead of explicit configuration, hence you need to familiarize yourself with the directory structure provided by Grails. controllers - Web controllers - The C in MVC. domain - The application domain. i18n - Support for internationalization (i18n). services - The service layer. utils - Grails specific utilities. views - Groovy Server Pages - The V in MVC. test - Unit and integration tests. | Application loaded in interactive mode. Type 'stop-app' to shutdown. More information on the run-app command can be found in the reference guide. The create-* commands in Grails automatically create unit or integration tests for you within the test/unit or test/integration directory. It is of course up to you to populate these tests with valid test logic, information on which can be found in the section on Testing. This will produce a WAR file under the target directory which can then be deployed as per your container's instructions. It's required to set "-Xverify:none" in "Application servers > server > Process Definition > Java Virtual Machine > Generic JVM arguments" for older versions of WebSphere. This is no longer needed for WebSphere version 8 or newer. Some containers have bugs however, which in most cases can be worked around. A list of known deployment issues can be found on the Grails wiki. Grails ships with a few convenience targets such as create-controller, create-domain-class and so on that will create Controllers and different artefact types for you. These are just for your convenience and you can just as easily use an IDE or your favourite text editor. There are many such create-* commands that can be explored in the command line reference guide. 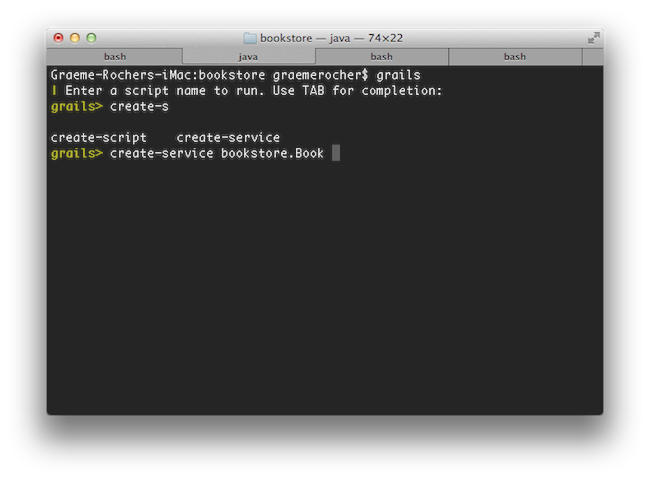 To decrease the amount of time it takes to run Grails scripts, use the interactive mode.